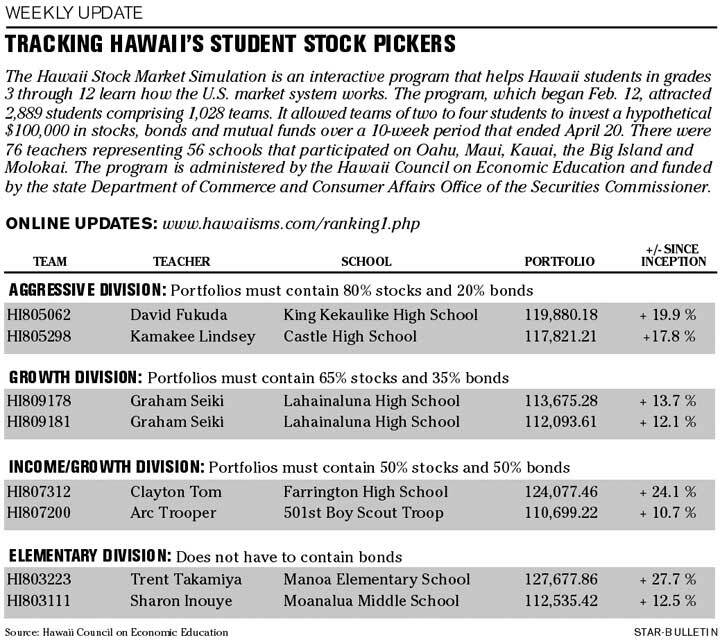 A four-person team from Manoa Elementary School posted a 27.7 percent gain to chalk up the best return in the semiannual Hawaii Stock Market Simulation Program. 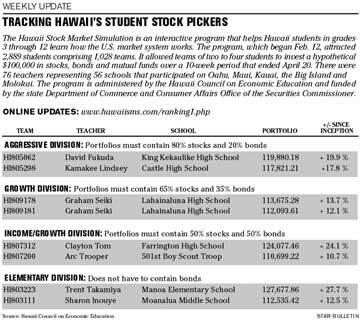 The Manoa squad of Louis Aila, Matthew Okimura, Kainalu Pitoy and Brayton Sakai -- taught by Trent Takamiya -- won the Elementary Division with $127,677.86 after beginning the 10-week contest with a hypothetical $100,000 portfolio. They were among 1,028 teams, 2,889 students and 76 teachers participating from 56 schools. Students on the winning teams received $100 savings bonds and second-place members received $50 savings bonds. The program was offered by the Hawaii Council on Economic Education. Results were recalculated after the end of the competition on April 20 to make sure students met the allocation requirements for their particular division. » Aggressive Growth Division: 1. King Kekaulike High School (David Fukuda), Peter Lanse, Ella Sword, Abcde Dung, Kaipo Morgan, $119,880.18, up 19.9 percent; 2. Castle High School (Kamakee Lindsey), students' names unavailable, $117,821.21, up 17.8 percent. » Growth Division: 1. Lahainaluna High School (Graham Seiki), Rishi Paloma, Roxanne Grantham, $113,675.28, up 13.7 percent; 2. Lahainaluna High School (Graham Seiki), Tom Wan, Matthew Aquino, $112,093,61, up 12.1 percent. >> Income Growth Division: 1. Farrington High School (Clayton Tom), Ranold Williams, Rodney Molina-Duarte, Lyle Kalani, Inoama Sione, $124,077.46, up 24.1 percent; 2. 501st Boy Scout Troop (Arc Trooper), $110,699.22, up 10.7 percent. » Elementary Division: 1. Manoa Elementary School (Trent Takamiya), Louis Aila, Matthew Okimura, Kainalu Pitoy, Brayton Sakai, $127,677.86, up 27.7 percent; 2. Moanalua Middle School (Sharon Inouye), Efren Bartolome-Fabella, Seokho Choi, Cody Eury, $112,535.42, up 12.5 percent.